A nameless man set adrift by a storm wakes up on a deserted island. Finding fresh fruit and water, as well as variety of animals and a sweeping forest of bamboo, the man decides to leave the island. The man builds a raft from bamboo, and attempts to sail away. However, an unseen animal unknown thing destroys the raft, forcing the man back to the island. Attempting to escape with another raft, his plan is foiled again by the unknown animal unknown thing. 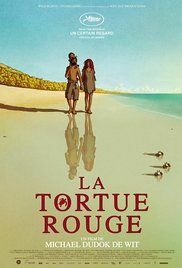 Trying a third time his raft being destroyed again, but once he is in the water he finds a red turtle facing with him. The turtle doesn't harm the man. The man retreats back to the island. Read more on Wikipedia.